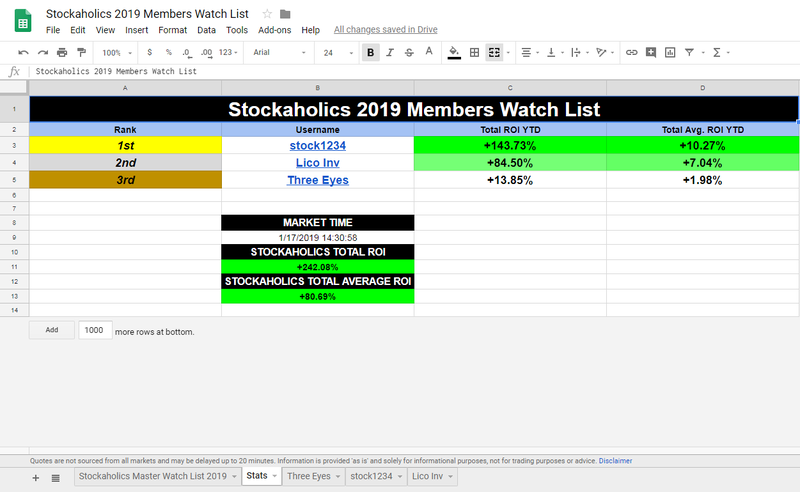 So I just cleaned up the individual members watchlist sheets a little here. How does this look so far? Ha ha, I've been more or less regularly updating my entries. The new design looks nice! Thanks @rStock for sharing those ideas! I think I like 'em. Hmm, actually this wouldn't be too much work for me to setup. 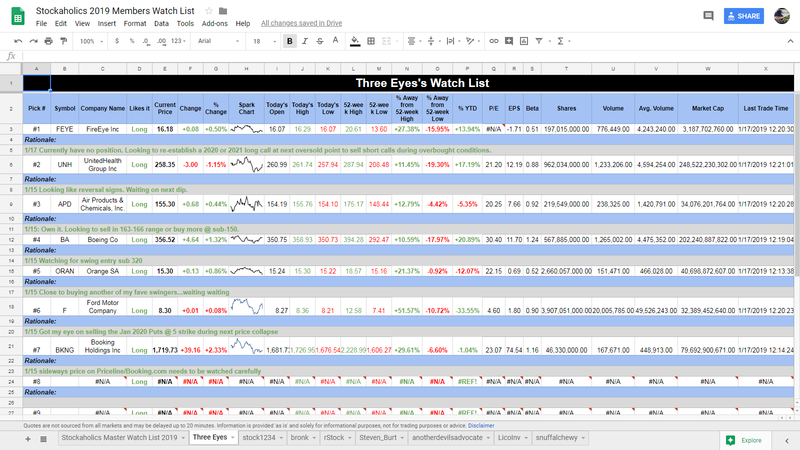 I can just replicate my spreadsheet template from my portfolio challenge worksheet and simply apply that here, modify it a bit for this Watch List and viola! So, I went ahead and created a "stats" sheet inside that watch list spreadsheet. So this is an interesting idea. 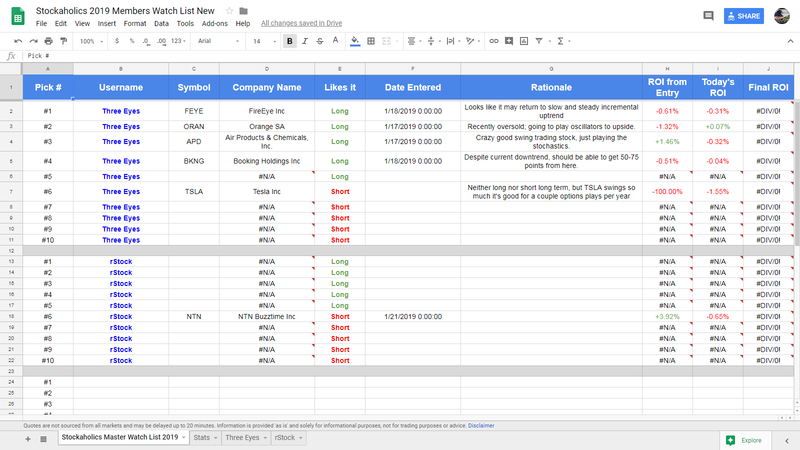 However, unfortunately there isn't an "automated" way to input dates of members form edits, but if you take a look at what @Three Eyes has been doing with his watch list, he has been adding the dates into the "rationale" field in the Google Form. This is actually already on the individual members watch list spreadsheets. If you look under the column "% Change" that will give you the current % gain/loss for the day for each members pick. And if you look under "% YTD" you'll get each members picks YTD % change. If you're looking for the "total %" that's on the "stats" page of the spreadsheet. Take a look at my first screenshot that I had posted on this post. Let me know if that is basically what you're looking for? Those were some good ideas, and thank you again for sharing them @rStock. Hmm, I'm not entirely sure if I'm understanding what you're saying @rStock... But, I'll try. So, I could be totally misinterpreting your idea here, but it would almost sound to me like you're looking for something like a "trading log" if you will. In theory, this sounds like an amazing idea. But, unfortunately I don't think that will be possible with the setup that I have. At least not in an "automated" way. Basically, if I'm understanding your idea correctly here, you'd like to have a Google Sheet that has everyone's picks, with everyone's entry and exit prices, thus as you say, the percentage gains and losses. Is that more or less accurate? I mean, I think there could be a way to add another field in the Google Forms, where members can input their actual entry prices in, but as you say, you want it to stop calculating the % gain/loss when they close out, and that just isn't possible in an automated way unfortunately. Unless of course....I made my Google Sheet "public" so everyone can "edit". But, I rather not do that. Again, in theory it sounds great. But, most likely not possible. But then we are talking about a completely different idea from what this thread was intended to be. This is a watchlist, whereas your idea sounds more like a trading log. Maybe I could add another field in the Google Form for dates, so members are having to put the dates in the "rationale" field. The nice things about Google Forms is that the possibilities are endless. I know I sound like a broken record sometimes saying this, but man I woulda honestly never even known about the Google Forms if not for @Three Eyes haha! I've got a surprise for you guys. I revamped the forms and spreadsheet today, and will share in here once it's 100% ready for testing. This will probably be my biggest project yet with the forms and spreadsheet. I really went all out with it this time. I think you guys will like. Stay tuned. Alright! Here we go... I've attempted to put @rStock's ideas in this thread together and came up with the following. In the Google Form, I have a fields for 5 long picks and 5 short picks (10 total). I can expand on this if needed, but admittedly compiling this form was quite a bit tedious to put it at best! So, I think I'll just stick with 10 total picks for now. Here's an example how how this looks. First, I've added a field for the date. This is useful for when you either enter or edit your picks so you don't have to put it into the rationale field anymore. Next, is the ticker, and rationale fields. And then finally a field for entry and exit prices. This is for when you want to put down an actual entry and exit price of the stock you're in. I only created one form (@Three Eyes) for this test, but will create additional one's once this has been fully tested out and is confirmed to be working. In the spreadsheet where the form will dump the data looks like so. Obviously there is no data input right now as the form hasn't been submitted yet. And here is the Google Form for you @Three Eyes if you can go ahead and test some of this out for me whenever you can get a chance! <-- click there to submit the form! I'll add more to this post a bit later, but it's getting awfully late here for me and need some sleep. This was a pretty monster form and spreadsheet, my biggest yet. I'm hoping this newest version will attract more people to participate in this. Also, @rStock let me know if this was essentially what you were aiming for in with ideas the other day. Whoops, looks like I found a small bug in the the form, but has been corrected now. Not sure if you had already attempted to submit @Three Eyes but should be good now. Let me know how it goes once you get the chance! 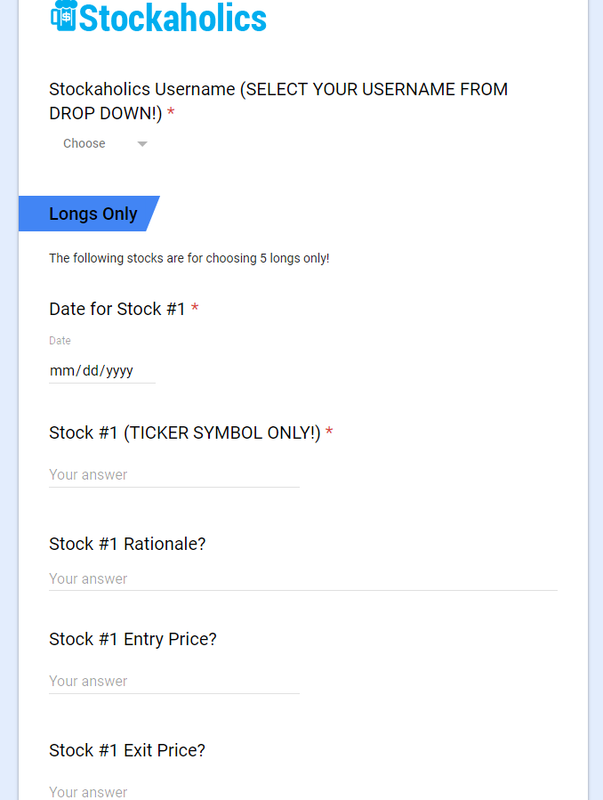 (2) Each entry needs to have time frame, like 1 month, 2 months or so ... You can go long for your entry, but stock go down and you wait for ever to stock go back up ... that's not everyone wants, right? Thanks @rStock, I'll continue to play around with this in the days to come. What I can do in the meantime is create a Google Form for you if you wanted to quickly test some of this out yourself as well. I'll try to have the form link posted in here for you once it's done. Thanks again for all the nice ideas in here to make this watch list more interesting. I am hoping with these new additions that more people will be encouraged to participate in this. OK, I just went ahead and created one for you as well @rStock. Admittedly, I haven't even tested any of this out but I am hoping it will all work correctly. <-- click there to submit your watch list! This is probably my most extensive use of the Google Forms with Google Sheets ever. BTW @rStock I was thinking about what you were suggesting in here yesterday as far as "time frame" goes. Hmm, I think that is a good idea as well. How about instead of adding another field into the Google Form for time frame, is it possible we could make use of the "rationale" field for adding time frame? Anyway, if you have any free time, go ahead and do me a favor and submit that new form that button linked above. If there's any other things you think we need adding let me know. I'll try anything at this point to get the ball rolling on this watch list once and for all haha. Whatever it takes to make this more interesting and engaging for all. I added some longs with date/price data, and 1 short with no date/price data. I think the Form is working as intended! This could be used for both tracking actual positions as well as "paper trading" a watch list. D'oh! I think I know what I did wrong with your form @rStock. I believe I forgot to remove the field requirements on your form when I removed them from @Three Eyes's form. Let me fix that now. One moment! OK, it should be all fixed now @rStock! Go ahead and give this link another test run for me now and let me know what kind of results you get. Thanks! Don't forget to select your username from the drop down menu at the very top of the form. I see on members watch list have ‘current roi’, it means total roi? @rStock - hmm, just to clarify what you're asking for here, when you say "today roi" do you mean something like a daily roi that changes/resets daily on each new trading day from the open? So, for example would something like this work?